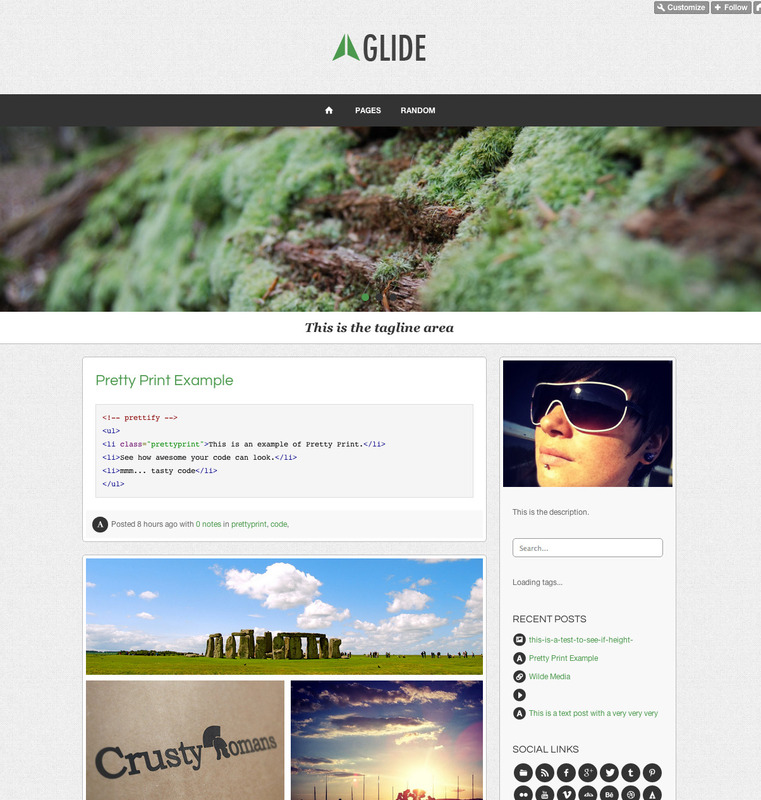 Glide is a 100% responsive theme. Suitable for any type of Tumblog. From photography to business. It is a great starting block for developers, designers and bloggers of any skill level. 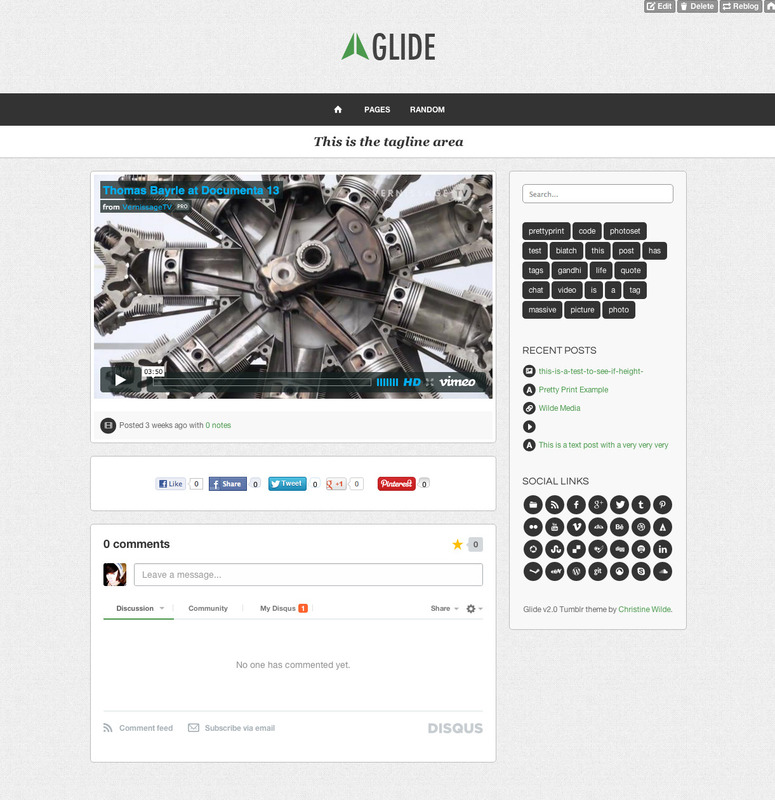 Glide comes packed full of features and more get added with every update. It features an extensive list of editable options via the Appearance panel, flickr stream, recent posts, fully responsive videos, slider and images. Check out the full list below! 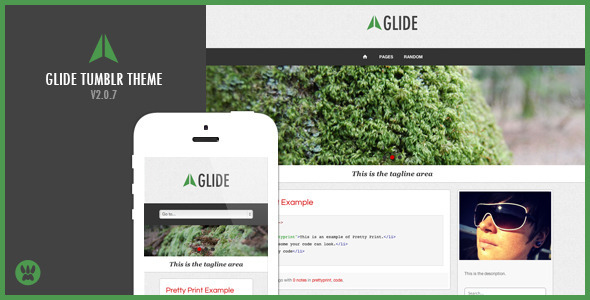 The Glide Responsive Tumble theme resizes when your browser is resized. No matter what device you view the blog on it will still look as good as the full site. No need to zoom in and try to press tiny buttons. Responsive ‘Flex Slider’ – Swipe the slides with your finger on iPad and iPhone. Tag Cloud Widget – shows number of posts with specific tags. Google Web Fonts – Use ANY Google Web Font. Google Analytics – Enter your analytics ID in the Appearance panel. ShareThis Buttons – Facebook Like & Share, Twitter, Google+ and Pinterest. Minimal graphics used so colours are easy to update through CSS. Free and Unlimited access to the Support Forum. Turn the drop down menu on or off. Change the text for the ‘Pages’ link in the menu when using drop down menu. Turn the image slider off or on. Change the animation of the slider from ‘slide’ and ‘fade’. Turn the Archive, RSS, Tumblr and Random buttons on or off. Insert the links to your social media profiles for in the header. Upload images straight to Tumblr for the image slider. Upload a larger profile image that resizes with the theme, also turn this on or off. Upload a logo to the header. Choose from 20 Google Web Fonts. Change the colour of the post content and sidebar backgrounds. Write a custom tagline and turn the tagline off or on. Change the colour of the theme (shown in red in the preview). Add a featured Vimeo or YouTube video in the sidebar. Show or hide the Recent Posts widget. Add in your Flickr ID for the Flickr Bar.